According to the article published in the Kumbabishegam Magazine which was released to commemorate the first Consecration Ceremony of the Temple on 1st September 1996, one Mr. Kunjukrishnan cleared a small piece of land at 832, Sembawang Road in 1962, erected an unauthorized shed and placed several shrines / deities and started praying. Taxi drivers congregated in the area for relaxation. After the death of Mr. Kunjukrishnan, Mr. Velayutham further cleared the area and brought in more deities. 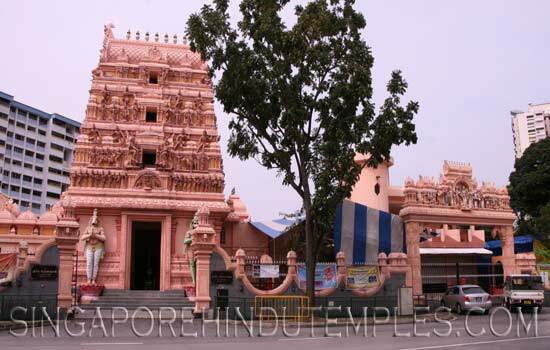 As the time passed by, the Temple was named "Sri Siva-Krishna Temple". With more and more devotees and revenue coming to the Temple, it was suggested that the surroundings of the Temple be kept clean so as to give the Temple a dignified look. In 1982, the Temple was shifted to the present site at Marsiling Rise. The land area is about 25000 Square feet. Various committees took care of the temple from 1982 to 1987. In 1987, a new committee took charge of the temple and immediately performed the ground breaking ceremony. On Wednesday 9 December 1987, "Sangu Sthapanam"ceremony was held and then actual construction of the temple followed. The first consecration ceremony of the temple took place on 1 September 1996. The second consecration ceremony of the temple took place on 23 March 2008.